View NSBA’s (official) media releases. Alexandria, Va. (March 9, 2016) – The National School Boards Association (NSBA), the leading advocate of public schools, announced today that Rory Davenport has joined the organization to strengthen its advocacy capabilities and enhance its brand. Alexandria, Va. (March 4, 2016) – The National School Boards Association's (NSBA) Technology Leadership Network (TLN) announces its “20 to Watch” honorees for 2015-2016. These education leaders from across the country are being recognized for their ability to inspire colleagues to explore and embrace innovative technology solutions and instructional strategies that contribute to high-quality learning experiences for all students. Honorees are from: Alabama, California, District of Columbia, Georgia, Illinois, Iowa, Kansas, Louisiana, Michigan, Missouri, New Jersey, New York, North Carolina, Ohio, Pennsylvania, and Texas. Alexandria, Va. (February 10, 2016) — The National School Boards Association (NSBA) joined the International Municipal Lawyers Association in filing a “friend of the court” (amicus) brief Monday in the U.S. Supreme Court, supporting the employer’s request for review in the case of City of Houston v. Zamora...."Such a rule levies an unfair and onerous burden on boards as employers given that no amount of internal process would protect them from liability if a jury later finds that the credited employee had a discriminatory motive,” said Thomas J. Gentzel, Executive Director, NSBA. Alexandria, Va. (February 9, 2016) — The National School Boards Association (NSBA), joins the State and Local Legal Center (SLLC) in filing a “friend of the court” (amicus) brief, urging the U.S. Supreme Court to review the Seventh Circuit’s decision in Bible v. United Student Aid Funds, Inc. The amici ask the Court to limit the power of federal agencies to interpret their own regulations when changing their position, and without first providing affected stakeholders with notice and an opportunity to comment on such a change. Alexandria, Va. (February 3, 2016) – In advance of today’s “Expanding Education Opportunity through School Choice” hearing, the National School Boards Association (NSBA) sent a letter to the House Committee on Education and the Workforce, highlighting the range of options for school choice that are provided by our nation’s public school districts. Alexandria, Va. (February 1, 2016) —The National School Boards Association (NSBA) applauds the recent Nevada District Court decision granting a preliminary injunction in the case of Lopez v.
Alexandria, Va. (January 19, 2016) — The National School Boards Association (NSBA), in a letter to the U.S. Senate Committee on Agriculture, Nutrition & Forestry, expressed its qualified support today of the Improving Child Nutrition, Integrity and Access Act of 2016 (ICNIA) in advance of Wednesday’s (1/20/2016) committee markup. Alexandria, Va. (December 10, 2015) - The National School Boards Association (NSBA) applauds President Obama for signing into law the bipartisan reauthorization of the Elementary and Secondary Education Act of 1965, now known as the Every Student Succeeds Act (ESSA). Alexandria, Va. (December 9, 2015) - The National School Boards Association (NSBA) commends the U.S. Senate for passing a bipartisan, bicameral bill to reauthorize the Elementary and Secondary Education Act of 1965, known as the Every Student Succeeds Act (S.1177). During the reauthorization process, there was a collective effort by NSBA and local school board members to advocate before Members of Congress for a modernized education law that underscores the importance of local governance, protects federal investments in Title I grants for disadvantaged students, and prevents the diversion of public tax dollars for private use. Alexandria, Va. (December 2, 2015) – The National School Boards Association (NSBA) applauds the U.S. House of Representatives for passing a bipartisan, bicameral bill to reauthorize the Elementary and Secondary Education Act of 1965, known as the Every Student Succeeds Act (S.1177). During this reauthorization process, NSBA has worked closely with lawmakers on both sides of the aisle to advocate for a modernized education law that affirms the importance of local governance, protects federal investments in Title I grants for disadvantaged students, and prevents the diversion of public tax dollars for private use. 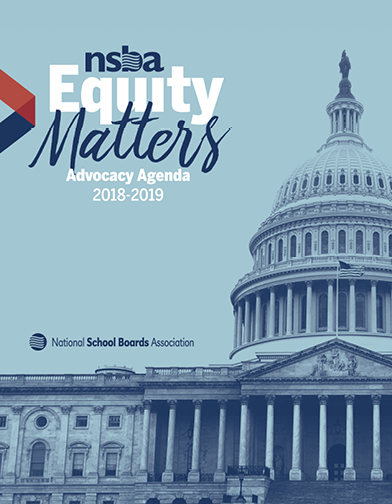 Read about the beliefs, policies, and resolutions of the National School Boards Association. NSBA believes that education is a civil right necessary to the dignity and freedom of the American people. NSBA believes that all students should have equal access to an education that maximizes their individual potential.